Carmen review (Handa Opera on Sydney Harbour, 2017) | Daily Review: Film, stage and music reviews, interviews and more. Director Gale Edwards’ spectacular, smart, and wildly entertaining 2013 staging of Carmen is the first production to be revived for Handa Opera on Sydney Harbour. Revisiting the production, it’s clear to see why. Edwards and her team found the perfect balance between spectacle and nuance — and given the scale of the glitzy annual event, that balance should be tipped somewhat in favour of spectacle — and created a dramatically thrilling and easily accessible rendering of this classic femme fatale story. The production updates the action to Franco’s Spain, in the late ’50s. It’s a pretty seamless move, allowing costume designer Julie Lynch to work with a big and bright colour palette of yellows, greens and reds, and the glamorous silhouettes and designs seeping into Spain from Hollywood and other parts of Europe at the time. It also allows choreographer Kelley Abbey to move across a broader spectrum of styles, from more traditional flamenco movements to Broadway-inspired numbers, reminiscent of Jerome Robbins’s work on West Side Story. Her choreography picks up on the infectious pseudo-Spanish rhythms of Bizet’s score, and is as stylish as it is striking. The dancers deliver at least as much bang as the second act firework display. The more intimate moments in this bold staging are almost as successful, thanks to a clever use of set designer Brian Thomson’s huge, blood-splattered stage, and John Rayment’s sharp lighting design. Unfortunately, this production has been remounted without the involvement of Edwards, Lynch, and Thomson. The trio wanted to return to ensure the integrity of their production, and even put out a public statement earlier this week advising that OA did not permit them any involvement in its remount. The production, by revival director Andy Morton, captures the spirit and vivacity of Edwards’ vision, making strong use of the chorus. The staging remains mostly the same, until the final scene, which has been drastically altered without the knowledge or permission of the original creative team. It is certainly not as “true to [the] original format as possible”. Please note, minor spoilers follow. 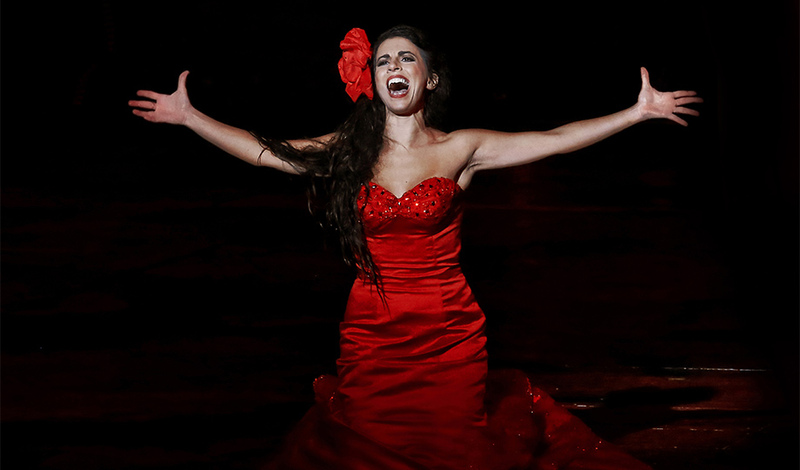 In the 2013 version, Don Jose runs past Carmen and slashes her neck open. The action mirrors the bullfight happening concurrently, out of sight. Carmen then turns very slowly to the audience to reveal her bloodied neck, and drops to her knees. As Don Jose approaches Carmen’s dying body to face what he’s done, a lift at the back of the stage rises with Escamillo standing triumphant over a slaughtered bull. It mightn’t be particularly subtle, but it has a much stronger impact than Morton’s rather limp ending. In his version, Don Jose catches Carmen and stabs her in the stomach. Neither Escamillo nor a bull rise at the back of the stage. Instead, Don Jose goes to Carmen and cradles her body. Did OA and Morton think they knew best? They didn’t. The new staging of this moment is clunky and bland, and seriously undermines the statements Edwards had made about gendered violence in this opera. Edwards’ final tableau tied the entire production together, forcing us to look at the violence committed against Carmen, and women in general, in an even more sinister and terrifying light. You’d think a male revival director might stop and think about how altering the final moment alters a rare and respected female director’s take on this story. Instead, this new ending shows a misunderstanding of the vision informing this production, and great disrespect to the original creative team. Thankfully, this Carmen is painted in relatively broad brushstrokes, so it manages to survive these changes. It’s also blessed with some very fine performances, led by Josè Maria Lo Monaco, who is an absolute fireball as Carmen. She has the character’s unapologetic swagger down perfectly, and captures her desperation with a gutsy and lusty vocal performance. No matter how clear the sound design by Tony David Cray, it’s difficult to critique the singing too closely in this outdoor setting. You certainly know if there are problems with phrasing or pitch, but tone and technique can be both lost and evened out in the sound mix. But the singing is, across the board, very good. Spanish tenor Andeka Gorrotxategi seems both vocally and dramatically at ease, expertly tracing Don Jose’s emotional downfall, as his obsession with Carmen and desperation grows. Luke Gabbedy’s Escamillo is gorgeously and seductively sung, as he struts and simmers his way through the Toreador song, but unlike with Don Jose, we don’t get a great sense of Escamillo’s relationship with Carmen. Natalie Aroyan makes the most of Micaela’s act three solo, commanding the stage from atop a suspended shipping container, while Jane Ede and Margaret Trubiano are a perfect pair as Carmen’s freewheeling and funny gypsy friends, Frasquita and Mercedes. Conductor Brian Castles-Onion, a veteran of Handa Opera on Sydney Harbour, manages to find a degree of subtlety in the Opera Australia Orchestra’s dynamic but well-disciplined rendering of the score. Keeping the action above stage and in the hidden orchestra pit below in perfect harmony can’t be an easy task, but Bizet’s compositions sound every bit as rich and effervescent as you could hope in an outdoor setting. All in all, this is still a very good Carmen, and well worth the time. But its success is down to the ingenuity of the original creative team, three of whom have been excluded from the production. Its shortcomings are, to some extent, a result of that exclusion. Carmen is at Fleet Steps, Mrs Macquaries Point, until April 23.